A changing table, it’s a piece that can really only be used for a couple of years at most. With my first I went with a long dresser right away and put a changing pad on top of it. Now out of diapers, I didn’t have to buy another piece of furniture for her big girl room. For Baby Girl I knew I wanted to paint something and happened upon a mostly solid hardwood changing table with baskets for a price I couldn’t pass up. Sold, this baby is getting a changing table. A changing table can function well with the right storage options underneath, and in our case a big walk in closet in the room. Once Baby Girl’s room was painted I decided this table needed to be coral to match the accent color in the room. I simply sanded it and applied a couple of coats of the wall paint (Behr Cool Melon 170B-4). To organize this piece I spray painted the 2 large wicker baskets white. One is filled with diaper essentials and slides out for easy access. The other with socks tights leg warmers etc. The bottom shelf has 4 stackable baskets with onesies and sleepers. These are the essentials early on, the rest of the cute stuff is in the closet. Having these items at hand will get me through night changes and sleep deprived mornings. 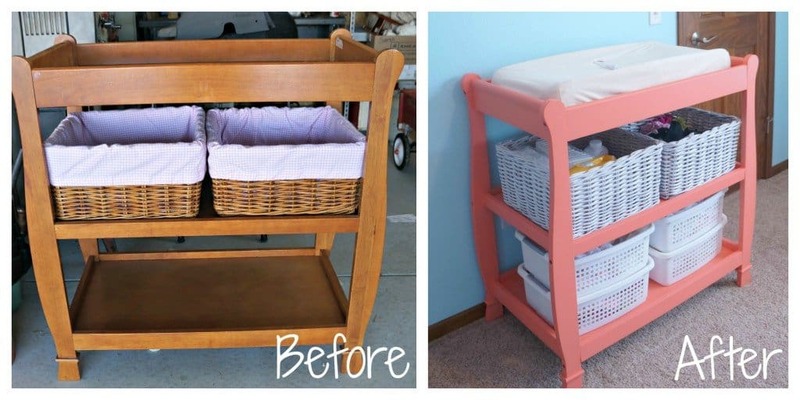 What do you use; changing table, dresser, or something else? Do share. Want to see more of this nursery and baby projects? Click on the picture below for all the posts. Oh how cute! It looks so much better since you painted it. 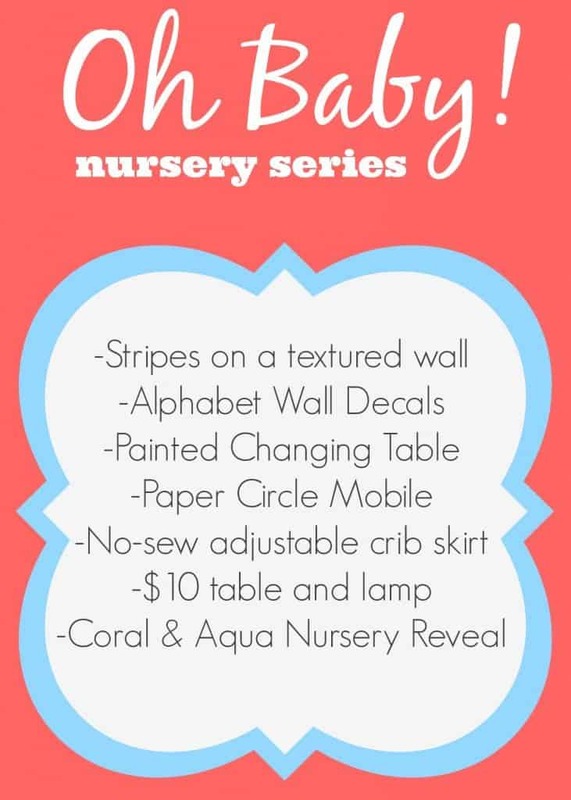 I’m loving this nursery series–please keep it coming! Thanks Carrie, you are too sweet. Love this color! Very pretty!! Great job! Thank you so much. I am a little obsessed with this color too. I’ll definitely check out your party. Your Dad did an awesome job! I love the coral color! 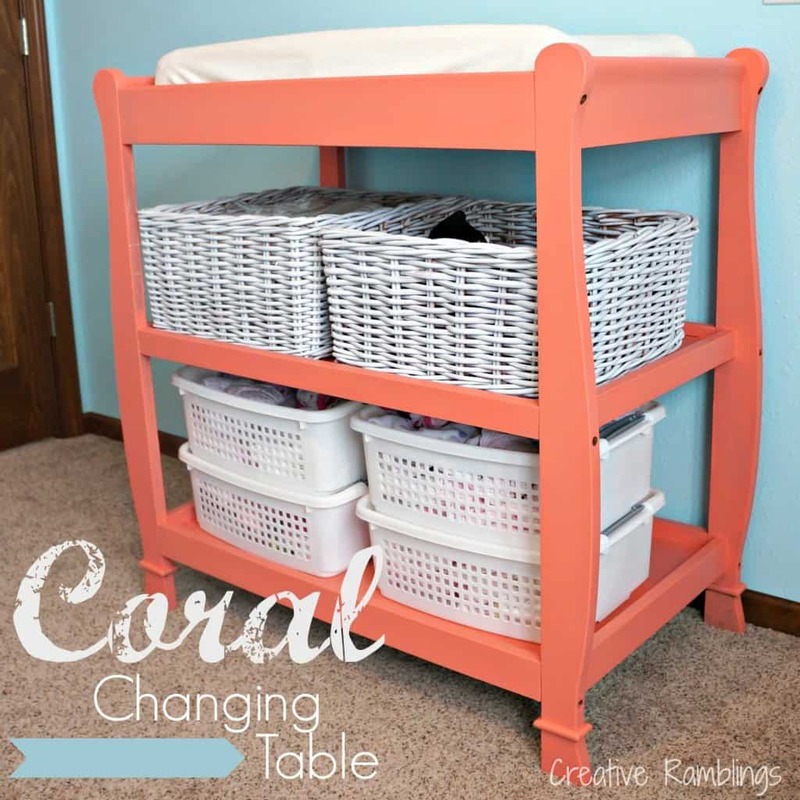 That is one beautiful coral change table. I would love for you to share on my Chic By You Link Party at http://chicbytab.blogspot.ca/2014/03/chic-by-you-wednesday-link-party-2.html. hope to see you there! Thank you Tabatha, I’ll be sure and check out your party.